The NOYES OFL280 FlexTester family offers an unmatched combination of fiber optic test functions, ease-of-use, portability, and value. 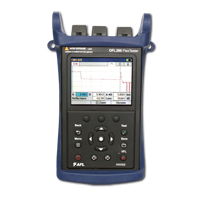 All OFL280 FlexTester models include an integrated single-mode 1310/1550 nm OTDR with PON-optimized and standard test modes, optical power meter, 1310/1550 nm laser source, and visual fault locator. For many users the two-wavelength OFL280-100 will provide the best balance of functionality and value. Testing at 1310 and 1550 nm is normally sufficient to certify point-to-point or FTTx PON fibers and allows the detection of macro bends. The three wavelength OFL280-101 and OFL280-102 models add 1625 nm or 1490 nm respectively. Testing at 1625 nm allows testing of the L band. Testing at 1490 nm is required by some network operators to certify FTTx PONs. The filtered, three-wavelength OFL280-103 can certify dark fibers at 1310/1550 nm, faultlocate live FTTx PON fibers at 1625 nm, and measure FTTx power levels at 1490 and 1550 nm, all from a single test port.